SILED4835 It Was Fifty Years Ago Today! 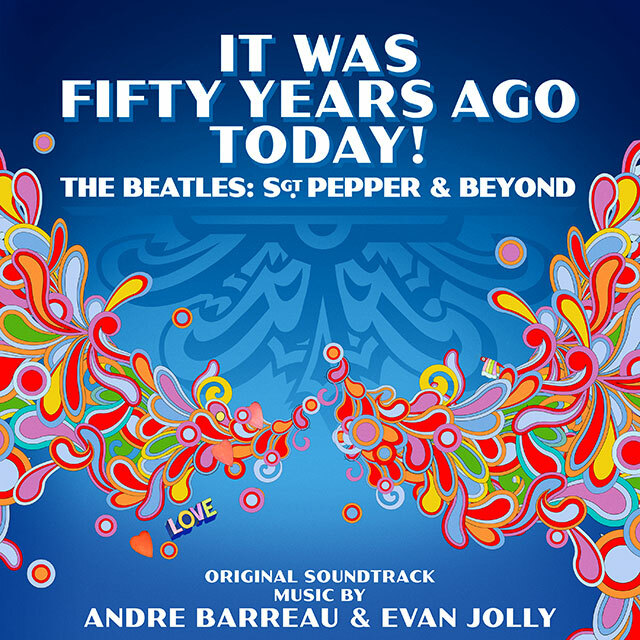 The documentary IT WAS FIFTY YEARS AGO TODAY! THE BEATLES: SGT. PEPPER & BEYOND examines the twelve months (Aug 1966-Aug 1967) that would arguably be the most crucial in the band’s career. A devoted fan since the age of nine, the film’s director Alan G. Parker has set out to explore this period by filming interviews with former employees, fellow musicians, family member and journalists, all of whom were there at the time. These stories are in turn supported by a vast array of impressive archival footage, much of it not seen since first transmission. Unusually for a documentary the specially written score was recorded in London and Prague with a full symphony orchestra. Andre Barreau is a versatile composer, songwriter and guitarist. In the latter role his electrifying solo on Robbie William’s worldwide hit Angels resonates as one of the great pop moments of the 90s. His previous film work includes Sliding Doors, Laws Of Attraction and Dangerous Parking. Since graduating in 2004 Evan Jolly has been in demand as a composer and arranger for the stage, screen, studio and concert hall. Theatre credits include: ‘The Illusionists: Witness the Impossible’ (Broadway, West End, US Tour), ‘The Illusionists: Turn of the Century’ (Broadway, World Tour), ‘The Genius of Ray Charles’ (Theatre Royal, Haymarket, UK & US tours), ‘Thriller’ (West End), ‘Great White Fog’ (Almeida Theatre, dir. Michael Attenborough). Film and TV credits include: ‘Hacksaw Ridge’ (dir. Mel Gibson – additional music), Netflix series ‘The Crown’ (additional music), ‘Kaleidoscope’ (dir. Rupert Jones – orchestrator), ‘Under The Skin’ (dir. Jonathan Glazer – orchestrator) ‘Tonight Is Cancelled’ (Fastnet Films), ‘Border Work’ (Windmill Films), ‘Graham and Alice’ (BBC). He has also provided music for a number of video games including ‘Dead Space 3’, ‘Evil Genius’ and titles in the ‘Harry Potter’ and ‘Command and Conquer’ franchises. Arranging credits include: Quincy Jones, Laura Mvula, Metropole Orkest, Gary Barlow, Mika, Joe Stilgoe, Lianne Carrol, Shaun Escoffrey, Samantha Barks, Katherine Jenkins, Faryl Smith, BBC Concert Orchestra, National Symphony Orchestra, London Music Works. 1. Fifty Years Ago Today!